Hosting a holiday is a serious undertaking — especially when you have about 20 dishes to make and you don’t have the luxury of multiple ovens. 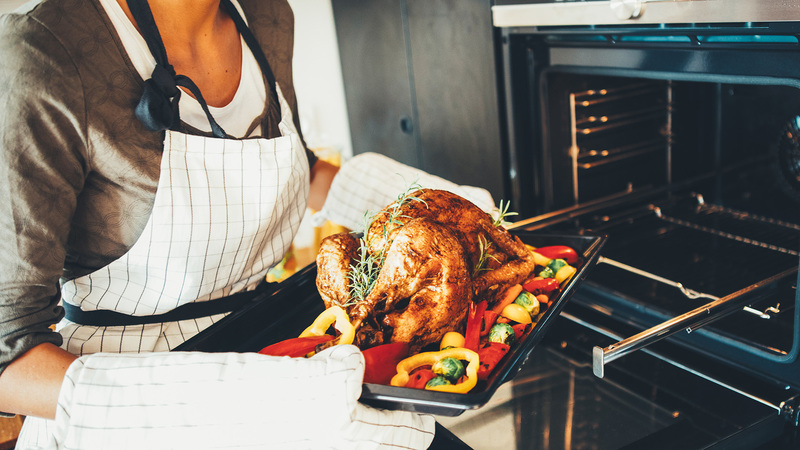 Sure, we all wish we had a stainless-steel double oven paired with a fancy fridge and granite countertops, but the reality for most of us is that we have only one oven. While it seems like the only solution is to jump ship and have someone else host, don’t give up yet. We have some tips to help you pull it off. Can you cook 2 or more dishes in the oven at once? Yes. Most people fret when it comes to cooking two dishes at once, but it’s your oven’s job to keep the internal temperature set to what you selected. It may have to work a little harder when two or more cold dishes are inserted, but trust that it will do its job. The dishes will typically take 15 percent longer to cook than if only one is cooking, so adjust the time accordingly. To ensure even cooking, make sure the oven is fully preheated before inserting dishes, and rotate the dishes halfway through. Can you cook one dish & bake another simultaneously? Yes, but there are some guidelines you’ll need to follow. First, baked goods are not flexible when it comes to temperature. Preheat the oven to the correct temperature for the baked good. Most cooked dishes are flexible when it comes to temperature — this includes meats, veggies, casseroles, baked potatoes and the like. It may take a little less or more time for the cooked dish to be done, but it will turn out the same. Baked goods are more of a science, and each variable needs to be precise. Second, make sure the meat (or main dish) doesn’t have a strong flavor, such as garlic. If that’s the case, it’s best to cook the items separately so the flavors don’t cross over. Meat is the most flexible. Technically meat can cook at any temperature until it’s done. The lower the temperature, the longer it will take, and the juicier it will be. If cooking multiple dishes, set the temperature to what the nonmeat dish requires. Meat stays hot for a while. Large roasts, such as a ham or turkey, will stay hot for an hour after coming out of the oven. Plan on cooking smaller side dishes during this time. Most ovens have a 25-degree variance. If one dish needs to be cooked at 350 degrees F and another at 400 degrees F, set the oven for 375. Most ovens are off by about 25 degrees anyway, so as long as it’s set around the required temperature, the dish will turn out fine. Arrange the dishes so there is enough space between them. Air should be able to circulate between all the dishes, so space them out accordingly.